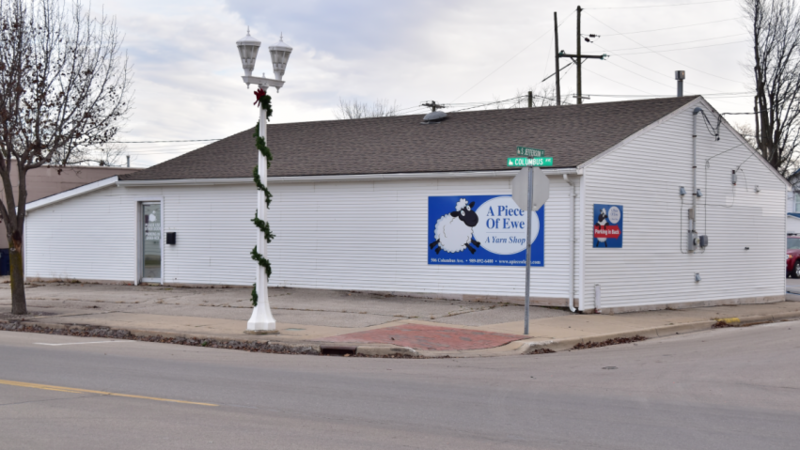 A Piece of Ewe has offered high-quality yarns, notions, and supplies for knitting and crocheting since we first opened at Pepper Tree Place in 2004. Now we're bigger and better than ever, happily settled at 506 Columbus Avenue in Bay City, MI. Drawing customers from Livonia to Traverse City, A Piece of Ewe aims to be The Destination for knitters to stop and restock on their way up north. We don’t just sell dozens of brands of yarn in all weights, colors, and fibers; we also offer classes for any skill level, from casting on your first stitch to mastering advanced techniques. In fact, our friendly instructors have helped more than 500 new knitters get started and continue learning over the years. Drop by any time during store hours to stitch and chat! We're happy to answer a quick project question or guide you to a class for more concentrated help. The daughter of an entrepreneur, Susan always wanted to sell things, starting with the worms she found in the yard as a child. As her prowess matured, she became known as the Girl Scout who could sell cookies to a diabetic, much to the delight of several neighborhood grandchildren. Four inches of a scarf. Well, a swatch of a scarf, really, and it’s still on the needles a few decades later. But that four inches, started when a mom sat down with her 9-year-old (who was more interested in climbing trees than casting on), got the ball rolling for what’s become a thriving yarn store in the heart of Bay City’s business district – a place where that daughter now sits down with other knitters of all ages and skill levels to create, to bond, and to grow. How did Susan go from knitting school dropout to local yarn store owner? On her own in a new city and surrounded by men at her job, she decided to take a knitting class to meet people. She abandoned her first project, a simple washcloth, in pursuit of a more intriguing intermediate-level baby sweater that sported an intarsia whale motif on the front. That sweater led to another, and soon the class instructor began encouraging Susan to open a yarn store of her own, going so far as to find a location to set up shop. At this point, she was a new bride with a full-time career. She’d just buried her father and settled his estate – and she was opening a yarn store. She purchased inventory with inheritance money and set up a booth at Pepper Tree Place, an arts and crafts mall that served as her test market. Three years later and a few blocks down the road, A Piece of Ewe sublet space in a popular gift shop. Susan and her crew held classes and sold yarn, patterns, notions, and needles for the next eight years until the landlord reclaimed the square footage for expansion. Grand experiment or life’s work? Susan’s decision became clear when she woke up at 3 a.m., designing floor plans and developing yarn displays. She believed she could, so she did it: she bought a building the day before Thanksgiving, started immediate renovations, and opened her own door at 506 Columbus Avenue – and the rest is history being made. Today, she's surrounded by colors and textures and people, and she couldn't be happier. "I love your scarf," she'll greet a returning customer. "You should go feel that cowl over there. It's really nice." She understands her customers -- what they like, what they make, what their next knitting adventure can be -- and they love her, returning regularly to check in, to visit, and, of course, to shop. Susan's vision is aptly named. A Piece of Ewe becomes just that: a piece of you. Cheryl is a dually skilled stitcher, accomplished in both knit and crochet arts. Her quintessential project is a gorgeous christening gown and blanket. While you walk through the shop, you'll find evidence of her expertise all around, as she creates many of the samples on display. When she's not knitting or teaching knitters, she enjoys reading the exploits of Serge A. Storms, a main character of the Tim Dorsey novels. Joyce's mother taught her to knit when she was 8 years old. As an adult, she worked in the field of medical prosthetics. These days, she knits, teaches classes, encourages fellow fiber artists, and visits her grandchildren. Retirement from banking and postal work brought Judy to the shop. A self-taught knitter, her greatest project accomplishment was finishing her first scarf and then teaching the class. She likes to read the work of Marie Force and vacation on Mackinac Island, and she believes Betty White would best portray her in A Piece of Ewe: The Movie. Ruth's needle artistry doesn't stop at her fantastic knitting skills -- she's also a registered nurse who has taught people to make quilts and heirloom christening gowns. She takes her books with chocolate, thank you, and feels that Helen Mirren will do a fine job of portraying her in A Piece of Ewe: The Movie. She loves any holiday that's spent with family and hopes to one day cruise the rivers of Europe in search of adventure, culture, and, naturally, yarn.